Oregon City's Johannes Schick, playing No. 1 singles for the first time, rolled to a 6-2, 6-4 win over Canby's Thijs Peperkamp to help pace the Pioneers to a 6-2 Three Rivers League boys tennis victory Wednesday at Canby High School. David Engleman added a 6-0, 6-1 win in No. 2 singles, Dylan Cochell won 6-1, 6-2 in No. 4 singles, and Oregon City won three of four doubles matches, lifting the Pioneers (1-4-1) their first win under new coach Ron Bronson. The No. 1 singles match carried an international flare, featuring two foreign exchange students — Schick from Germany and Peperkamp from The Netherlands. Schick, still recovering from a broke right leg sustained during football season, looked steady on his feet, gaining the upper hand by getting to several balls that some players might not have gotten to. "When I'm warming up for a match, I'm always looking at my opponent and trying to figure out what his strengths are and how I can beat him," Schick said. "Because he (Peperkamp) was a good player, I automatically played better too, and that's how I like it. "It was a great match. He was pretty good and he made me sweat. I think the difference was I kept the ball in play and put a lot of pressure on him, and the I didn't make as many mistakes as he did. That's basically how I won." Schick broke his right tibia in the Pioneers' Oct. 25 junior varsity football game against West Linn and had a cast on his leg for two months. 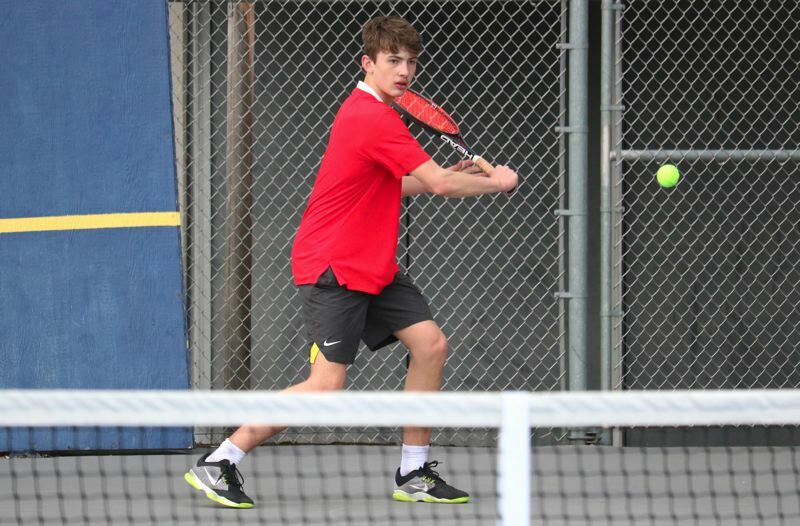 His mobility was limited to start the tennis season, so he eased into competition by playing doubles in Oregon City first two matches before moving up to No. 2 singles in the next matches. Schick then got elevated to No. 1 singles after senior Michael Perez, last season's district singles runner-up, ran into an eligibility issue following Monday's 4-4 tie with Tigard. "When I got off the bus, I thought about the being my first time playing first singles and I wanted to show my teammates that I could win in that spot," said Schick, who arrived at Oregon City with six years of club tennis experience in Berlin. "I felt I was in good shape today and I was happy with how the match came out. "It's awesome to be thought of as the best player on the team. Playing first singles is a great feeling and it's a lot of fun." Oregon City's Joel Villamor and Evan Scott won 6-3, 6-0 over Canby's Owen Bradfute and Alex Sunderland in No. 1 doubles, while Corbin Salvey and Truman Adams won 6-4, 6-1 in No. 2 doubles and Mason Weseman and Alik Bonerchuk won 7-6 (7-3), 63 in No. 4 doubles. CLACKAMAS 13, REYNOLDS 1: Nick Vaughn went 2 for 3 with a double and four RBIs, and Jack Dorn added a two-run double to help the Cavaliers to a Mt. Hood Conference blowout win at home Friday over the Raiders. Clackamas starter Jackson Jaha pitched the first three innings, checking Reynolds on one hit with five walks and six strikeouts. Robbie Butenschoen and Grant Schoen drew mop-up duty over the final four innings, helping the Cavaliers (7-4, 3-0 Mt. Hood) keep pace with Barlow and Central Catholic atop the league standings. OREGON CITY 7, TUALATIN 6: Dalton Welch scored the game-winning run on Jordan Weseman's two-out, bases-loaded single in the seventh inning as the Pioneers won Thursday's final game of the three-game Three Rivers League series with the Timberwolves at Oregon City. Oregon City's Christian Mansfield threw 1 1/3 shutout innings in relief of starter Hunter Davis to earn the victory and help the Pioneers (4-5, 1-2 Three Rivers) snap a three-game skid. The Pioneers sent 10 batters to the late in the second inning against Tualatin start Cameron Springers and scored six runs (three earned) on five hits, one walk, and one Timberwolves error to take a 6-0 lead. Tualatin (7-2-1, 2-1) countered with two runs in the fourth and four runs in the fifth before Weseman decided the game with his walk-off, RBI-single in the seventh. PUTNAM 8, ST. HELENS 0: Putnam pitchers Tanner Drog and John Poglio combined ona three-hitter with two walks and eight strikeouts, pacing the Kingsmen to a home win and a sweep of the three-game Northwest Oregon Conference series with the Lions. Nick Geertsen went 2 for 4 with an RBI-single as Putnam (8-3, 3-0 NWOC) racked up seven hits to go with four walks and capitalized on eight St. Helens errors. HILLSBORO 12, MILWAUKIE 6: Kane Kiaunis went 2 for 3 with a triple, a homer, and five RBIs, leading the Spartans to a road win Friday and a sweep of their three-game NWOC series with the Mustangs. Kammeron Mecham and Bjorn Carlson added two hits each for Hillsboro (6-5, 3-0), while Kaden Middleton went 1 for 3 with a two-run triple for the Mustangs (3-7, 0-3). CLACKAMAS 5, REDMOND 4: Maddie Stateler drove in the tying run with an RBI-double and then scored the game-winning run on Shay Monise's single to center as the Cavaliers rallied for a non-conference home win Wednesday over the Panthers. WESTVIEW 6, OREGON CITY 5: The Pioneers rallied with three runs in the sixth and two in the seventh, but left the potential tying run stranded at second as the defending 6A state champion Wildcats held on for an non-conference home win Wednesday. Avery Borkus, Phoebe Borkus, Emily Dugan, and Hannah Stewart had two hits each for the Pioneers (3-7). THE DALLES 6, PUTNAM 1: Bailey LeBreton threw a two-hitter with seven walks and 11 strikeouts, leading the Riverhawks to a non-conference home win over the Kingsmen. MARIST CATHOLIC 8, GLADSTONE 0: Senior pitcher Ariel Carlson checked Gladstone on four hits with two walks and 15 strikeouts as the Spartans ran away with Wednesday's non-conference home game, snapping the Gladiators' four-game win streak.